JJ Perez has toured in Japan for the Osaka Pro promotion..
January 29, 2005-All Pro Wrestling Central Coast: JJ Perez defeated Eric Matlock..
February 5, 2005-All Pro Wrestling: Nate Rulez & JJ Perez defeated Vennis DeMarco & Chris Colioni..
February 19, 2005-All Pro Wrestling: Billy Blade & Kaden defeated JJ Perez & Dana Lee..
April 9, 2005–ECWA Super 8 Tournament: JJ Perez defeated Tyson Dux (1st round) | Puma defeated JJ Perez (2nd round)..
April 22, 2005–NWA ECCW: J.J. Perez defeated MR 2 in the first round of the Pacific Cup Tournament..
April 23, 2005–NWA ECCW: Aaron Idol defeated J.J. Perez in the semi-finals of the Tournament..
April 30, 2005–All Pro Wrestling: Austin Aries won four-way over J.J. Perez and Puma and Taru (All Japan)..
May 28, 2005–All Pro Wrestling: J.J. Perez defeated Killa J Mathias..
June 11, 2005–All Pro Wrestling: J.J. Perez vs Kyu Ketsuki ended in a NO CONTEST..
June 24, 2005–All Pro Wrestling: J.J. Perez defeated Davey Richards..
July 9, 2005–All Pro Wrestling: J.J. Perez defeated Puma to win the Internet title..
August 6, 2005–All Pro Wrestling: J.J. Perez defeated Jason King…. October 22, 2005–All Pro Wrestling: J.J. Perez defeated Shannon Moore..
October 29, 2005–All Pro Wrestling: J.J. Perez defeated Sara Del Rey to retain the Internet title..
November 12, 2005–APW Thanksgiving Thunder: J.J. Perez won four-way over Mr. Primetime and Kadin and Jesse Jimenez..
December 3, 2005–All Pro Wrestling: J.J. Perez defeated Tito Aquino..
January 28, 2006–All Pro Wrestling: J.J. Perez vs Mr. Primetime ended in a draw..
March 4, 2006–APW Gym Wars: J.J. Perez vs Mr. Primetime ended in a No Contest..
March 25, 2006–APW Gym Wars: JJ Perez defeated Ricky Romero..
April 1, 2006–APW Gym Wars: JJ Perez defeated Jardi Frantz…. April 15, 2006–All Pro Wrestling: JJ Perez defeated Frankie Kazarian to retain the Internet title..
May 7, 2006–Inoki Dojo: Chad Wicks & Black Tiger defeated J.J. Perez & Scorpio Sky…. 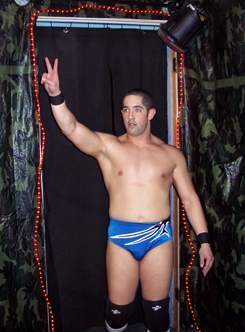 May 12, 2006–Big Time Wrestling: J.J. Perez defeated Kafu in the best match of the night..
June 17, 2006–NWA Pro: Rocky Romero & Alex Koslov & J.J. Perez beat Karl Anderson & Mikey Nicholls & Joey Ryan..
July 8, 2006–APW Gym Wars: JJ Perez beat Scotty Aboot and Melissa in a 3-WAY to retain the Internet title..
July 29, 2006–APW Gym Wars: Kafu & Billy Blade vs JJ Perez & Mr. Prime Time was ruled a No Contest..
August 12, 2006–APW Gym Wars: Mr. Prime Time beat JJ Perez in the 1st Round of the APW Title Tournament..
August 26, 2006–All Pro Wrestling: J.J. Perez defeated Joey Ryan in Bakersfield, California..
October 7, 2006–NWA Pro: T.J. Perkins beat J.J. Perez | J.J. Perez beat T.J. Perkins (rematch)..
November 5, 2006–NWA Pro: EGO defeated T.J. Perkins & J.J. Perez in a Tag Team match..
November 18, 2006–APW Gym Wars: JJ Perez defeated Derek Sanders in Hayward, California..
~~~JJ Perez & Melissa beat The Mafia (Vennis DeMarco & Chris Colioni) in a “Loser Leaves APW for 6 Months” match..
November 8, 2008–Pro Wrestling Revolution: T.J. Perkins beat Mr. Wrestling IV and Michael Modest and MPT in a 4-WAY..